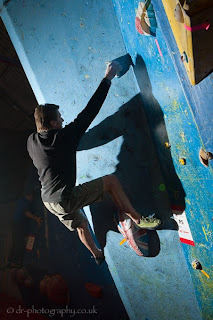 In spite of the cold, icy conditions, a big crowd turned out for Round 2 of The Climbing Works Winter Bouldering League. The usual suspects were there vying for the cash problems with Ned Feehally doing a fine job of first figuring out the beta, and then dispatching in a relatively quick time. The £125 looked like an early Christmas present for Ned but unbeknownst to us, for the second round in a row, we had a visiting WAD in our presence. Arjan de Kock from South Africa may not be a familiar name on the UK climbing scene but he's 'done a bit' as Percy would say. Arjan played Scrooge and made Ned frown by dispatching the cash problem but no matter how many others manned up, nobody else matched the final hold. 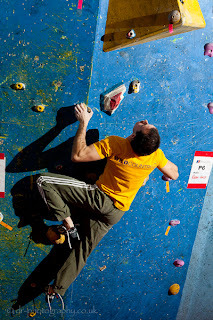 On the Women's problem Katy Whittaker got stuck in but was left struggling to figure out the beta for the last 2 moves. With time running out Katy got herself sorted and was reaching for the final hold.....but no joy this time. The Women's cash prize now rolls over for the next round which will take place on the 7th January. You can see the full scores for round 2 on the website. Also here is the standings after 2 rounds and a link to a ton of photos on our facebook page (all coutresy of dr-photography.co.uk). The 2 winners of the round 2 raffle - a free pair of FiveTen shoes of their choice - are Ste Bond and Joe Broadhead. 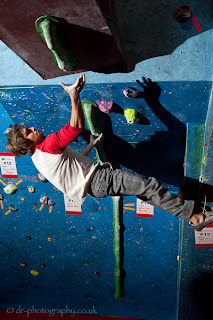 A very nice early Christmas present from us and Five Ten. Just get in touch at info@climbingworks.com and we'll get your prizes sorted.